Fresh renderings for One Beekman, Richard Rogers’ first residential building in the U.S.
New renderings have been unveiled for One Beekman, a mixed-use development designed by Richard Rogers, and it has nearly reached its 25-story pinnacle in the Financial District. 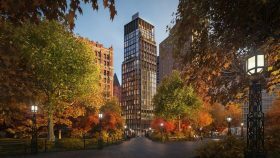 As the firm’s first residential project in the United States, Rogers Stirk Harbour + Partners have designed a tower that provides every single apartment with views of City Hall Park by shifting the circulation core to the south, according to the New York Times. The front of the building is open with oversized windows, allowing for half of the 31 total condo units to have outdoor terraces overlooking the park. 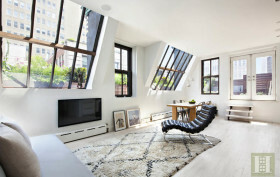 A unique two-bedroom penthouse lined with massive angled skylights is available at City Hall Tower in Tribeca, asking $2.3 million. But this premier pad is touting more then just greenhouse windows and multiple exposures. It also features a planted wraparound terrace surrounding it on three sides. So we’re not just talking about a prime location, but a prime location with a lot of outdoor space. Winning!